As the clock neared midnight on a stormy night on July 1, 1776 Delaware’s Founding Father Caesar Rodney set out on one of the most important journeys in American history. Rodney rode 80 miles on horseback to Philadelphia to cast a tie-breaking vote for American Independence in the Continental Congress. Centuries later, the descendant of Rodney’s equestrian hero continues to serve the First State. 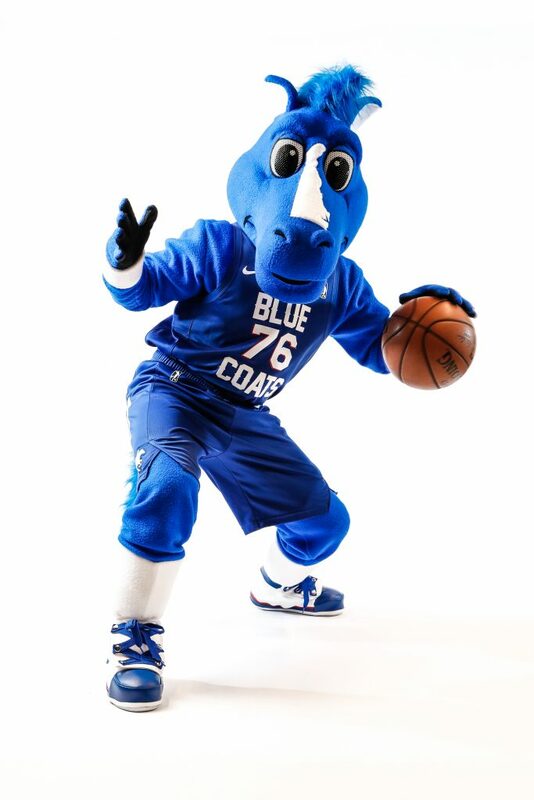 COATY proudly represents the Delaware Blue Coats as the team’s mascot, community ambassador and noble steed. Today, the Blue Coats honor Coaty’s great-great-great-great-great grandhorse, who’s likeness is depicted in the team’s logos and uniforms. Coaty’s mission is to use the power of basketball to help Delaware’s youth achieve success in the classroom, on the court, and in their neighborhoods.